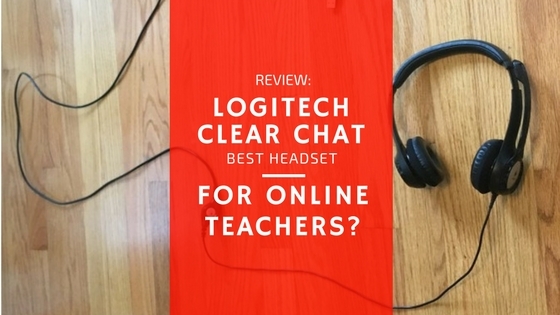 Logitech Clear Chat Comfort USB Headset H390-Best Headset for Online Teaching? – Noise-canceling mic to block out unwanted sounds while teaching online. Rotates for enhanced noise reduction. – Doubles as a gaming headset! – These Logitech USB headset ear pads aren’t exactly over-the-ear. They seem a bit small to me, so they tend to press on my ears rather than envelope them in soothing comfort. – I’ve ended classes hogtied in the lengthy USB cable. Compatible With:Microsoft Windows 2000, Windows XP, Windows Vista, Windows 7, Windows 10 and Mac OS X, Skype calls, conference calls. First, please allow me to paint a poetic picture: It was spring in 2015, and I was as green as the buds popping on the trees in terms of teaching online. I had ended a call with a mentor, and one of his final tips was to ditch the iPhone earbuds and replace them with an actual headset. His reasoning was sound: I’d appear more professional and offer better audio quality to my students. I’m always on the lookout for products that balance functionality with cost. Coming from a family that previously owned Logitech keyboards, computer mouses (as an ESL teacher, I’m feelin’ dangerous using this form with ‘mice’ drilled into my head, but I did look it up), and webcams, I purchased this exact headset from Amazon. Now, nearly 3 years later, having a proper headset is a requirement for my job. This headset and I are past the honeymoon phase, and I’ll admit my eyes have strayed now and then to newer, flashier headsets, but I’m still sticking by my Logitech H390. In this review, you’ll find out why as I walk you through my favorite aspects of this teaching tool. Features for Teachers-What Can This Headset Do For Your Classes? Two of my favorite features of this headset are the noise-canceling microphone and the in-line volume and mute controls. You’re 20 minutes into a trial class with a brand new student, and things are going great! The kid is laughing and engaged, or the adult is opening up about pain-points regarding learning the topic, and you’re killing it! Then, your neighbor decides to mow the lawn. Now, you’re not phased by the noise due to the large, padded headphones, but you’re worried all that noise is blasting right into your student’s ears and interrupting your perfect first lesson. I’ve had this exact situation happen, and the audio levels didn’t budge when the lawnmower started. The microphone reduces background noise, and it even flips out of the way when you’re watching a movie or listening to music. You’re teaching one of your regulars. The kid’s parent always sits right next to him or her during class, or the adult is a serious student, and you don’t want to receive a poor review if something goes wrong…but so far you’re still doing an awesome job! Then, the mailman drops a package at your front door. The dog comes running, barking, crashes into your legs, barks some more, and then returns to its chew toy. The Logitech H390’s USB cable is 7.9 ft long, so there’s plenty of cord for you to maneuver it out of the dogs way without yanking it from the computer. As for the noise, you easily pressed the mute button as you moved the cable, so none of it transmitted to your student! Is this another True Life: Noise Happens Too Often When I Teach? You bet it is, and I’ve many more examples like it! The mute button is perfect for coughing fits, sneezing fits, baby crying fits, or for when you need to yell at the kids to stop running around the house, all without hurting the ears of your student or reducing the quality or professionalism of the lesson. It’s an excellent feature, and it’s simple to use. This headset has two padded earphones. I’ve seen cheaper ‘single-ear’ options whose single earphone and microphone I’m sure work fine, but I’m not a truck driver listening out for other cars on the highway, and I don’t need one ear uncovered to eavesdrop on conversations in the street outside. I like to have both ears listening to my student so I can offer the most helpful and accurate answers and corrections to their questions and responses. Travel often? The mic rotates upwards so it won’t catch and snap off. You can check out this hard shell traveler case that was built for it as well, and our review of the best portable wifi hotspot for online teachers, too. Learn more about this comfortable, efficient headset! How to Use the Logitech H390-It’s Easy! No software to install, no adapters necessary. The advanced digital USB allows for excellent sound quality without the hassle. Simply plug it into the USB port and teach. As I mentioned in the Cons above, the USB cable is very long and often feels in the way with my current setup. This would be easy to solve by running it around the chair or table in a better way, and there’s also a convenient clip to attach the Mute/Volume control buttons to your shirt, but if you don’t need another cable in your life, check out some of these wireless headsets instead. Additionally, the padding for the earpieces is comfortable compared to other headphones and headsets I’ve had. But they’re sized in such a way that they press on certain points of my ears, so I often find myself removing them and rubbing my ears towards the end of the day. 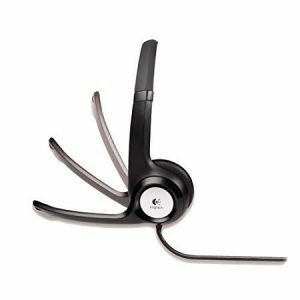 While there are other headsets that might work for teaching online, the Logitech Clear Chat Comfort USB Headset H390 is my go-to pair. It provides quality sound, reduces background noise transmission, has an easily-accessible mute button, and is comfortable enough to get me through the day, all at a reasonable cost. This pair you see has lasted me almost 3 years. I’ve experienced no issues with durability, and I plan to buy another pair should these ever decide they’d like to retire before I do. Have a question about the headset or this review? Want to share your own experiences with this headset or offer an alternative? Please feel free to leave a comment below and let me know what you use! This entry was posted in Best Tools For Teaching Online and tagged Logitech Headset, tools for online teaching. Bookmark the permalink. ← TEPPY Review-Best WiFi Hotspot? Thanks for the great review. I have a one-eared headset at work–for when I am on a phone call–and I always find the noises in my open ear distracting. It’s difficult to focus when I can hear other conversations going on around me! I also do online meetings from my home office, so I think I just found my new headset! I tend to talk pretty loud and sometimes my current headsets have issues handling this, they transfer broken sound or garbled messages. This is true even when I play with the input values a decent amount. Does this headset allow the mic to flex not only up and down, but forward and backward from the mouth so I can keep it further away from myself? Every bit helps for me! While this headset doesn’t allow forward and backward movement of the mic, I shout, sing, laugh, exclaim, and make sound effects each and every class. I’ve heard myself on some of the replays and never noticed the sound breaking or distorting, and I’ve never received any comment about issues like that from my students’ parents. I think it’s the way the mic is designed that helps reduce background noise and deliver clear audio. I hope that helps, and just let me know if you have any other questions!